Some tempting traditional recipes to break Lent as is only proper. 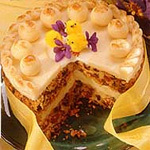 Lamb or cakes, everything you need for a perfect Easter lunch is here! 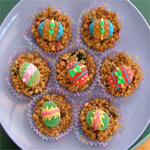 See the article about Easter origins and traditions. Both in France and in the UK, the traditional Easter lunch implies inevitably lamb and generally a nice juicy leg. 2. Peel and slice 1 or 2 garlic cloves. Make small cuts in the underside of the meat and insert the slices of garlic into this. Put the meat onto the foil with the bay leaves underneath. 3. In a small bowl, mix the margarine thoroughly with the remaining ingredients. Spread this mixture over the upper surface of the meat, using a wetted palette knife. 4. Loosely wrap the foil around the joint of meat, place in a roasting tin and roast in a preheated oven, 200°C/400°F/Gas Mark 6, for about 1 3/4 hours. 5. Unwrap the foil and baste the joint with the melted fat that has collected in the base of the tin. 6. Continue roasting; uncovered, for a further 30 minutes, until the crust is brown and crisp. 1. Using a sharp knife, carefully remove the lamb's outer skin. Discard. 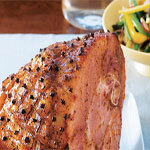 Season generously with ground black pepper. 2. In a bowl, combine the finely chopped garlic, Dijon mustard, ground ginger and soy sauce. Stir until well blended with a fork or small wire whisk, then beat in the olive oil drop by drop. 3. Place the lamb on a rack in a roasting tin. Brush the mustard mixture all over the meat. Cover and leave to marinate for 4 hours in a cool place. 4. Heat the oven to 170C (325F) gas 3. 5. Just before cooking, season the lamb generously with salt. 6. Cook the lamb in the oven for 1 hour 30 minutes for pink meat, or 1 hour 45 minutes for well-done lamb. Turn the lamb twice during cooking, so that it is browned evenly all over. This will also prevent the mustard coating from forming a brown crust. 7. 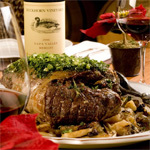 Transfer the roast lamb to a heated dish and leave in a warm place for 10-15 minutes to settle before carving. 8. Meanwhile, wash the watercress in cold water, removing and discarding the stems. Drain and pat dry with a clean tea-towel or absorbent paper. 9. 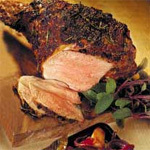 To serve, make a bed of watercress leaves on a heated serving dish and lay the Mustard roast leg of lamb on top. 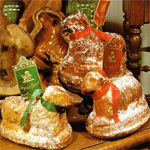 Traditionnal cakes shaped like a lamb! 4. oil or butter a lamb-shaped cake mold; pour in the batter; bake in a preheated 180°C. (350°F.) oven for about 25 minutes. The cake is done when a skewer inserted into the center comes out clean; it should be nicely risen and golden. 5. Turn off the oven; open the door and let the cake cool gently in the pan for 5 minutes. 6. Turn out of the pan gently, because it is very fragile. 7. Sprinkle with icing sugar (as in Alsace) or glaze by pouring some melted good-quality chocolate over the cake (as in Germany). then when hard put mini eggs into the nest. 1. For the ferment starter, mix the beaten egg with enough warm water to make up approximately 290ml/½ pint of liquid. 2. Whisk in the yeast, sugar and flour until the mixture is smooth and well combined, then cover and set aside in a warm place for 30 minutes. 3. For the dough, sieve the flour, salt and ground mixed spice into a large mixing bowl, then rub in the butter using your fingertips. Make a well in the centre of the mixture, then add the sugar and lemon zest to the well and pour in the ferment starter. 4. With your hands, gradually draw the flour at the edges of the bowl into the well in the centre, mixing well with the ferment starter, until the mixture comes together as a dough. 5. Turn out the dough onto a lightly floured work surface and knead lightly until smooth and elastic. 6. Carefully work the mixed dried fruit into the dough until well combined. 7. Grease a large, warm mixing bowl with butter. Shape the dough into a ball and place it into the prepared bowl, then cover with a clean tea towel and set aside in a warm place for one hour to prove. 8. Turn out the proved dough onto a lightly floured work surface and knock back the dough. Shape it into a ball again and return it to the bowl, then cover again with the tea towel and set aside for a further 30 minutes to rise. 9. Turn out the dough onto a lightly floured work surface and divide it into 12 equal pieces. Roll each piece into a ball, then flatten slightly into a bun shape using the palms of your hands. Cover the buns again with the tea towel and set aside to rest for 5-10 minutes. 10. Grease a baking tray with butter and transfer the buns to the tray. 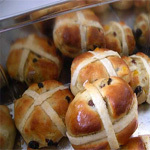 Cut a cross in each bun, almost cutting all the way through the dough, so that each bun is almost cut into quarters. 11. Wrap the tray with the buns on it loosely in greaseproof paper, then place inside a large polythene bag. Tie the end of the bag tightly so that no air can get in and set aside in a warm place for a further 40 minutes to rise. 12. Preheat the oven to 240C/475F/Gas 8. 13. Meanwhile, for the topping, mix the plain flour to a smooth paste with two tablespoons of cold water. 14. When the buns have risen, remove the polythene bag and the greaseproof paper. Spoon the flour mixture into a piping bag and pipe a cross over the cuts in each bun. 15. Transfer the buns to the oven and bake for 8-12 minutes, or until risen and pale golden-brown. As soon as you remove the buns from the oven, brush them with the hot golden syrup, then set aside to cool on a wire rack. 1. To make the almond paste: place the sugar and ground almonds in a bowl. Add enough beaten egg to give a fairly soft consistency. Add the almond essence and knead for a minute until the paste is smooth and pliable. Roll out a third of the almond paste to make a circle 18cm/7in in diameter and reserve the remainder for topping of the cake. 2. Preheat oven to 140C/275F/ Gas 1. To make the cake:cream the butter and sugar together until pale and fluffy. Gradually beat in the eggs until well incorporated and then sift in the flour, salt and spice (if using) a little at a time. Finally, add the dried fruit, peel and grated lemon rind and mix into the mixture well. 3. Put half the mixture in a greased and lined 18cm/7in cake tin. Smooth the top and cover with the circle of almond paste. Add the rest of the cake mixture and smooth the top leaving a slight dip in the centre to allow for the cake to rise. Bake in the preheated oven for 1½ hours. Once baked, remove from the oven and leave to cool. 4. When you are ready to decorate the cake, preheat the oven to 180C/350F/Gas 3. Brush the top of the cooled cake with the apricot jam. Divide the remainder of the almond paste into two; roll out a circle to cover the top of the cake with one half and form 11 small balls with the other half. 5. Place the circle of paste on the jam and set the balls round the edge. Brush all the top with a little beaten egg. 6. Return the cake to the preheated oven for about 10 minutes or long enough for the almond paste to brown.